The Ohaus CS 2000 Portable Balance delivers accurate readings in a balance that’s portable, lightweight, and compact. 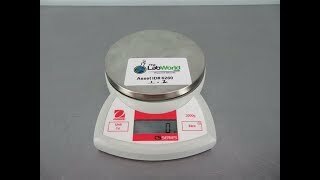 This lab scale has a removable large stainless platform roughly 6” in diameter to accommodate larger samples, and runs on 3 AA batteries, giving you 300 hours of use, or plugged in with a standard AC adapter. This digital scale has a maximum capacity of 2000g, with a readability at 1g, in grams, pounds, ounce and newtons, shown on the easy to read LCD screen and takes about 3 seconds to stabilize. This low-profile laboratory scale also features radio frequency protection that gets you stable dependable results, even in areas where radio waves are present. This Ohaus CS 2000 Portable Balance has been fully inspected and is ready to ship. Please note that these units have batteries and no power adapter is included. All of our lab equipment comes backed with our standard warranty. Should you have any questions, please don't hesitate to contact us.